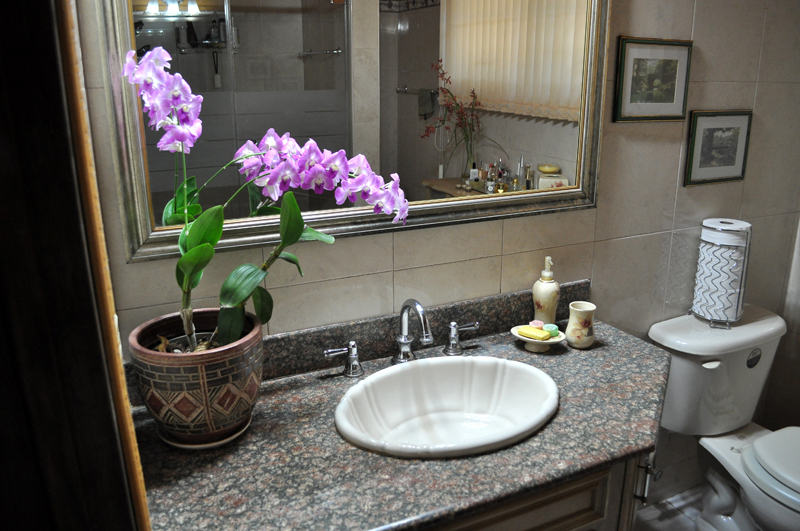 HADIYAH | Montego Bay, St. James The granite top vanity was designed by us. 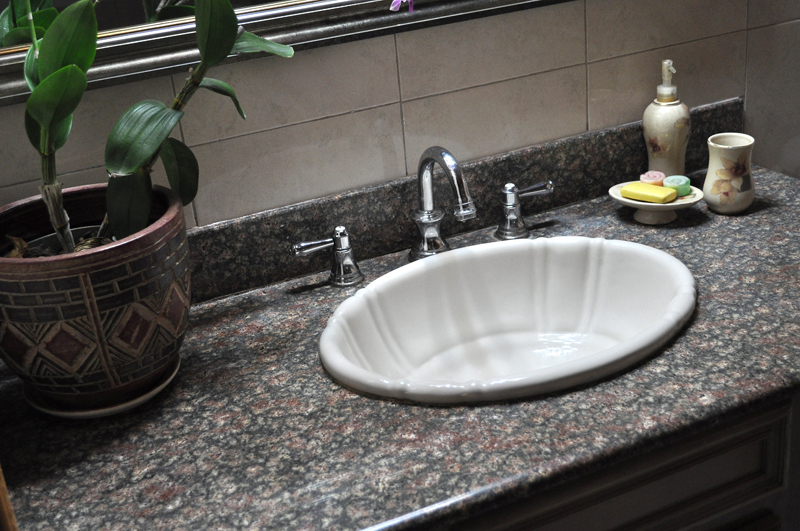 The goose neck chrome faucet imbues greater function and comfort of use. The gray, rose and tan granite top, tan wall tiles, chrome fittings, and rustic pewter mirror frame, form an unmistakable harmony of tones, colors and textures. 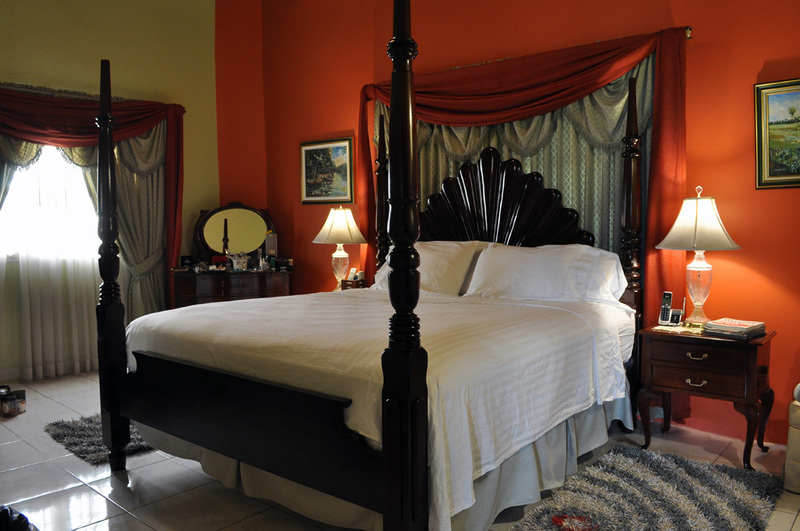 HADIYAH | Montego Bay, St. James Designed for rest and rejuvenation while crafted for passion, this room features a colonial inspired mahogany four poster bed against a dramatic tangerine wall. HADIYAH | Montego Bay, St. James The custom-made solid wood cabinet features deep drawers and pull-out trays hidden behind clean-line doors. No space is wasted! The storage extends beneath the sink, as well as the angled corner of the cabinet; designed to facilitate easy access to the WC. 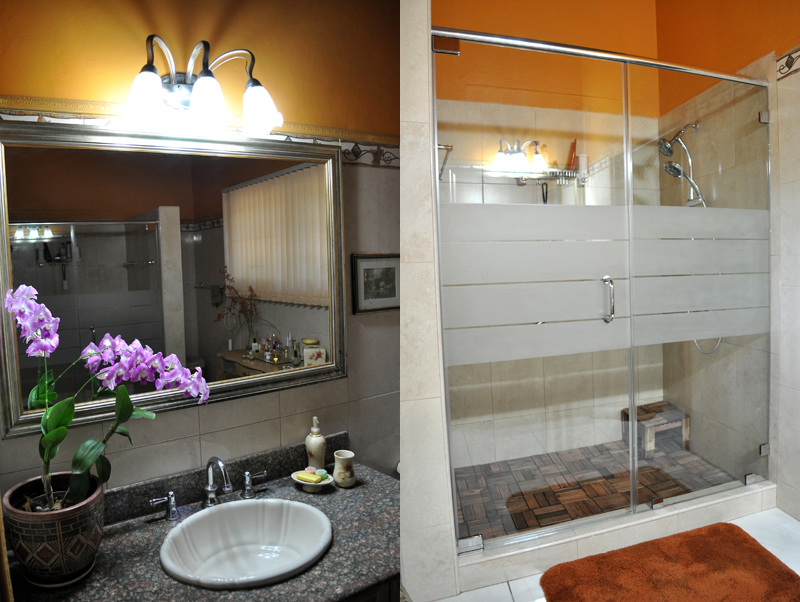 HADIYAH | Montego Bay, St. James Designed for a single professional woman, the bathroom has accentuated tangerine walls, closely complimenting the master bedroom to which it is attached. The concrete shower floor is covered with a floating teak floor, adding a spa-like feel and charm. 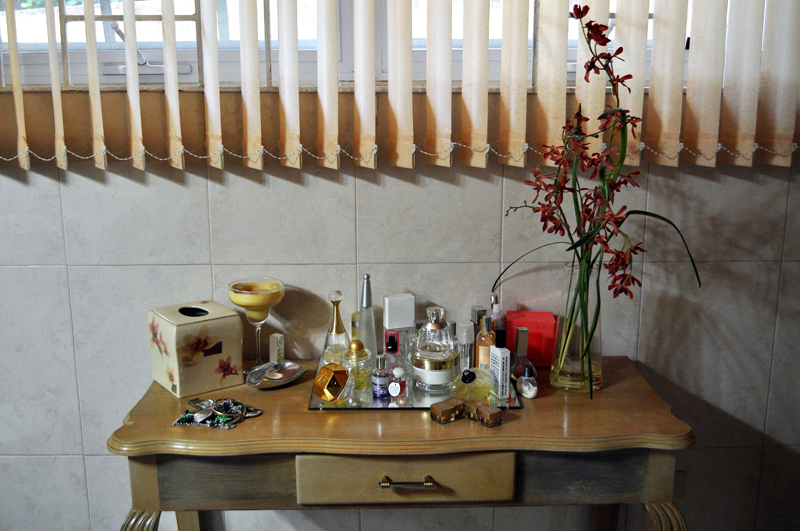 HADIYAH | Montego Bay, St. James This is one of two dressing tables we created by repurposing my client’s old dining table. Equipped with a free standing mirror and bench, it serves as a dressing table. The large window above provides an abundance of natural lighting to this make-up station. 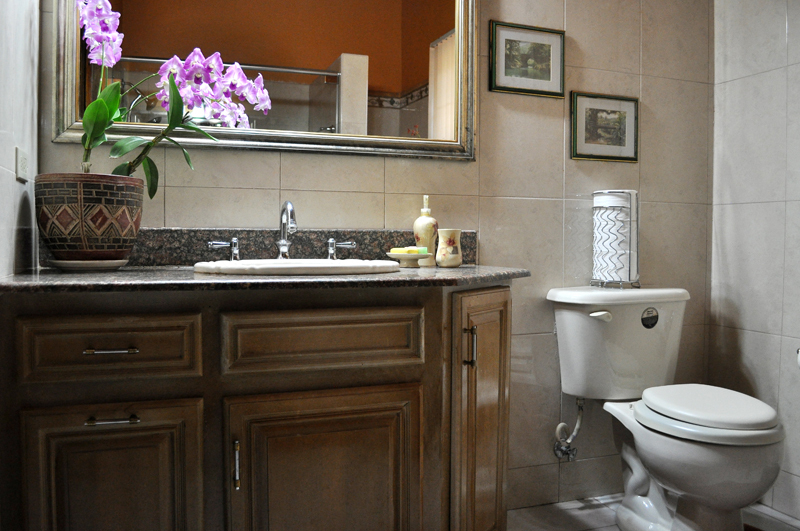 HADIYAH | Montego Bay, St. James As a lover of art and an avid orchid grower, my client appreciated the addition of art work in the bathroom, as well permanent places to house blooming orchids from her garden, allowing her continued enjoyment on the inside. 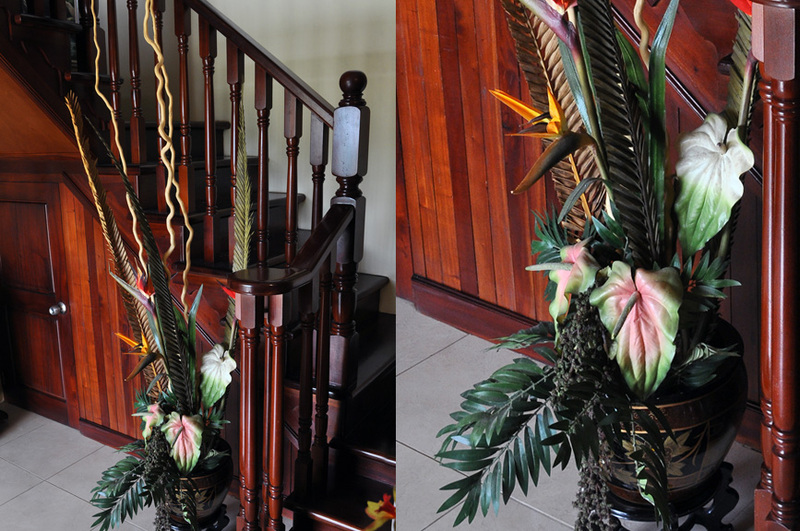 HADIYAH | Montego Bay, St. James >This silk arrangement softens the architecture of the stairs while drawing attention to its sweeping form. The flower choices where deliberately made to appear as fresh cuts from the garden outside. HADIYAH | Montego Bay, St. James I am an avid believer of respecting and celebrating materials. This solid mahogany staircase, while taking you from the Foyer to Main Floor, celebrates the material in its details, and allows the wood’s grain and color to shine. 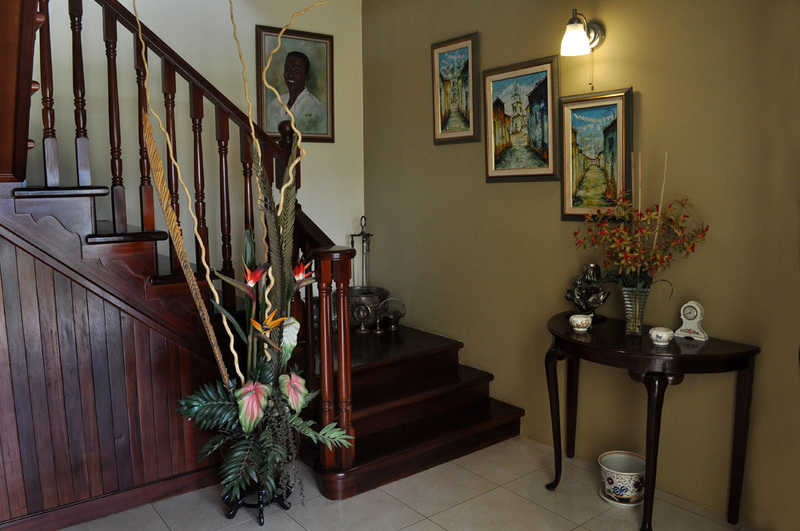 The Clients portrait hangs prominently in the Foyer as a welcome to her space.